Does Rover get upset when you leave the house? Do you find objects in pieces when you return? Do you find suprises on the floor when you step through the door? These could be indications of separation anxiety. They can also be symptoms of other medical problems, so you should always see a veterinarian before treating for separation anxiety. This is a challenging disorder. To be successful in changing this behavior, it often will require outside help. There are veterinary behaviorists (OSU has two at their Veterinary Hospital) and some dog trainers who can provide the guidance to overcome this anxiety. These suggestions are not meant to take the place of working with a veterinarian, behaviorist or trainer. They are some ideas that can prove helpful for some dogs. There are two things you need to do to help your dog overcome separation anxiety: (1) decrease your dog’s dependency on you and (2) increase the dog’s confidence. These are not easy tasks to accomplish and can take quite some time. 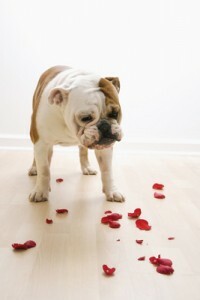 The times the dog is most likely to be destructive is as soon as you leave and right before you return. To get the dog used to you leaving, try gathering all of your things, coat, keys, purse, etc. and sit down. Don’t let your dog get excited; if he does just ignore him. The more excited you are, the more likely the dog will react. Do this multiple times on different days, at different times. Then slowly progress to walking out the door and coming back in. Then go outside for longer periods of time, getting him used to you leaving. When you come back in the door, Rover will be equally excited. Don’t reach to pet him or say anything. Walk in put your stuff down and do something until he is calm. Then you can pet him and talk to him. It doesn’t sound very nice, but you are trying to condition him that your leaving and coming home is no big deal. Hopefully, this will train him to be a little more confident that you will always return. Never punish your dog if it has done something bad while you were gone. It will in no way reduce the chances of him doing it again and in fact may make it worse. Also try putting your dog in a crate to limit its access to the house. Some of the time it works, because the dog feels more secure in a crate. For some it can make it worse. When first trying the crate, act like you are going to leave, but just go outside and listen for what your dog does for about 15 minutes. Give your dog something to do while you are not there. This may include a toy that he only gets when you leave or a Kong frozen with peanut butter. It takes a very long time to get frozen peanut butter out! If all conditioning fails, there are medications to help calm your dog. These are a last resort, and if used, must be in conjunction with trying to re-condition the anxiety.